The story of Elijah is told in 1 Kings with the specific story of Elijah and the broom tree in 1 Kings Chapter’s 18 and 19. The Northern Kingdom had eight kings in its first 58 years as a nation. This story about the great prophet Elijah occurred during the reign (874-853 B.C.) of King Ahab. Ahab married Jezebel, daughter of the king of Sidon, who worshiped Baal. Ahab built a temple to Baal and consecrated priests to serve Baal. In an encounter between Elijah and King Ahab, Elijah challenged the prophets of Baal. The challenge was to see which god — Baal or God — would answer his prophet(s). Ahab took the challenge, gathered 450 Baal prophets, and met Elijah on Mount Carmel. Many Israelites were present to watch the outcome. Baal’s prophets placed a cut up bull on an altar of wood dedicated to Baal; the prophets called to Baal to ignite the sacrifice. Despite entreating Baal from morning until evening and slashing themselves, the sacrifice to Baal did not catch on fire. Elijah repaired God’s altar on Mount Carmel which had fall apart from disuse and neglect. He arranged wood on the altar, cut a bull in pieces, and placed the pieces on the altar. Massive amounts of water were poured over the bull and altar. Elijah prayed naming God, the God of Abraham, Isaac, and Israel. He asked God to light the fire so a) the people would know that he did these things at God’s direction and b) to let the people know that the Lord was God. Immediately, fire consumed Elijah’s sacrifice. The people fell prostrate and cried, “The Lord – he is God! The Lord – he is God!” (1 Kings 18:39). Elijah commanded the people to seize the Baal’s prophets; they were taken to the Kishon Valley and slaughtered. When King Ahab reported what happened to Queen Jezebel, she sent a messenger to Elijah that she would have him killed by that time tomorrow. Instead of a day of triumph for Elijah, it became a day of terror. He fled Samaria and ran over 100 miles to an area south of Beersheba in Judah. Elijah came to a broom tree, sat down under it, and prayed that he would die. Elijah was completely disheartened; finally he fell asleep. While he was sleeping, an angel touched Elijah, and directed him to get up and eat. Looking around, Elijah saw a cake of bread baked over embers and a jar of water. Elijah ate and drank, then lay down again. The angel came back a second time, touched Elijah and said, “Get up and eat, for the journey is too much for you” (1 King 19:7). Elijah rose, ate, and drank. Strengthened by the food, Elijah traveled 40 days and nights until he reached Mount Horab, where God gave Moses the 10 Commandments. 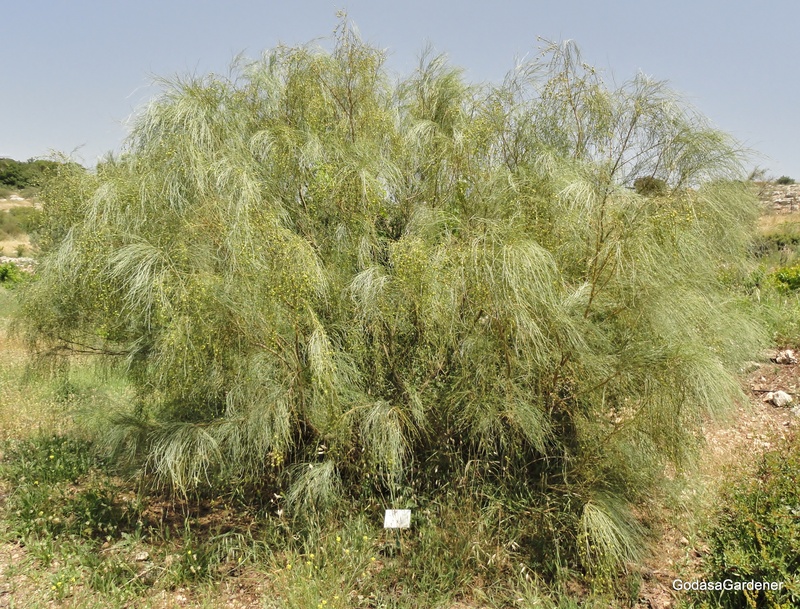 In Biblical Israel, the white broom tree was used for kindling in cooking stoves and coals were made from its roots, trunks, and branches (Job 30:4). Broom embers retain their heat for long periods after they appear to be dead ashes. An ancient Israelite reading that on awakening Elijah saw bread baked on embers would have assumed the embers retained fire from an earlier traveler and were blown into heat to bake the bread. Desert travelers have reported forming a layer of broom embers to suit their size. They covered the embers with a 2–4 inch layer of sand or fine soil. The sand-cover embers provided a warm mattress during the cold desert night. Perhaps Elijah had such a mattress as he slept under the broom tree. The broom tree that Elijah rested under in the Negev was the Retama raetam, also known as the white broom and the white weeping broom tree). The broom tree is thought to be indigenous to the Middle East, North Africa, and possibly Sicily. In Israel, it is widespread in deserts including extreme deserts, shrub steppes, and Mediterranean woodlands. Although called a tree, it is a shrub with a broad canopy. In Israel, the white broom tree is most beautiful between January and April when it is covered with a myriad of white flowers. Flowers emit a honey fragrance. At times seeds remain viable in the soil for several years until the seed coat wears down. Mass germination can occur after a fire that destroys seed coats. In Israel rabbits consume pods and have been known to disperse seeds up to 6.2 miles from parent plants. Seeds can survive soil being mulched or composted. The symbolism of the broom tree is renewal. With renewal comes a restoration of vigor and a new freshness; what is faded or disintegrated is made whole. When Elijah arrived at the bloom tree, he was exhausted, depressed, and ready to die. What was to be a victory for God and Elijah over Baal and his prophets turned into Elijah fleeing for his life from Jezebel and her henchmen. If anyone needed to be renewed, it was Elijah. The broom tree provided this renewal for Elijah. If the shrub was blooming, Elijah would have seen thousands of tiny white blooms and smelled their soothing scent. Sinking below the tree’s canopy, Elijah fell asleep on a soft bed of broom leaves. Warm embers under the sand may have helped maintain his warmth in the cool desert night. The broom tree’s embers were used to bake a cake of bread for Elijah; and God provided Elijah water in the desert. Just as God renewed Elijah using attributes of the broom tree, God’s renews us. We are made new when we accept Christ as our Lord and Savior; however, God knew that after our new birth, we would need to be refreshed and restored to vigor from time-to-time. For just these times, God had Isaiah write, “those who hope in the Lord will renew their strength. (Isaiah 40:31 2002). When we hope in the Lord, we have confidence in him. Having confidence in God can renew us so we can walk, run, and soar without collapsing from the weight of the world’s challenges. Paul told Christians another way they could be renewed was to stop conforming to the patterns of this world (Roman 12:2). Patterns of this world include being politically correct and not talking about God and religion, using Sunday morning to play golf or grocery shop without crowds rather than attending worship service, or believing that marriage is not a sacrament from God and divorce is a viable alternative to working through tough times. In The Message, Peterson (2003, p. 343) puts renewal this way, “don’t become so well adjusted to your culture that you fit into it without even thinking” instead fix your eyes on God and he will change you from the inside out. Reflection: God, I want so badly to be renewed, to be changed from the inside out. I want to be different from this culture I live in. Why should I feel comfortable in this society when my true home is heaven?